Dr. Molly Frew Hodges graduated from the UMKC School of Dentistry. She practices General Dentistry, Cosmetic Dentistry, and Invisalign. She has extensive training in dentistry, is Invisalign certified and has Cosmetic dentistry training. 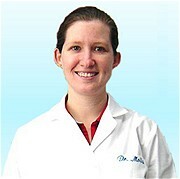 She continually attends courses to offer the best of all treatment options to her patients. Dr. Molly stays up to date with the latest advancements in dentistry and safe dental materials through attending continuing education seminars. She takes great satisfaction in helping you maintain optimal oral health thru comprehensive and preventive patient care. Dr. Molly is a member of the American Dental Association, the Missouri Dental Association and the Greater Kansas City Dental Association. Dr. Molly would like to welcome you to our office. We take pride in helping you maintain your oral health. Our practice is devoted to comprehensive and preventive care. She enjoys seeing adults and children of all ages and looks forward to serving your dental needs.